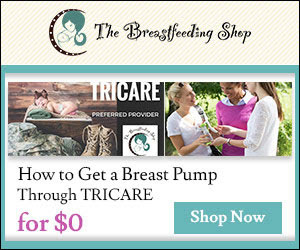 Did you know if you have TRICARE Insurance you can get a breast pump at $0 cost to you!? The Breastfeeding Shop lets you choose from the top rated breast pumps available and will ship directly to you with no out of pocket cost! Click Here to learn more or order your breast pump today! At my on-post prenatal visit, the doctor gave me a paper prescription for a breast pump, as well as a list of phone numbers of companies to order from. However, I thought it would be more simple to order online than to call and have to get them my prescription somehow. So I went to thebreastfeedingshop.com to order a pump. It could not have been easier. I filled out the Insurance Order Form (I have Tricare Prime), and the Accessory Order Form. On the Insurance Order Form I uploaded a picture of the prescription that my doctor had given me using my phone. I got the pump in three days - a Spectra S1 (I've previously owned the Medela, and the S1 is much better in my opinion) and lots of equipment to go with it like bottles, extra tubes, etc. It was the easiest experience and fast shipping! The Breast Feeding Shop made it so fast and easy! I'm recommending them because I've personally used their service!